Left: Dim, a character from A Bug's Life (1998). 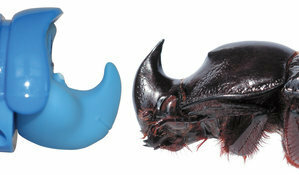 Right: Megaceras briansaltini, a rhinoceros beetle discovered in 2006. "It just goes to show how diverse ancient mammals are, that we can just imagine some bizarre critter and later find something just like it." — Guillermo Rougier on the similarity of Cronopio dentiacutus to Scrat. Accidentally Correct Zoology happens when a fictional species is made up for a work, or a fictional animal quality or ability is, only for a real example resembling it to be discovered later on. The animal or other organism should first appear in a work of fiction, without the author believing that it actually exists, to count. What was once thought to be Artistic License  Biology is later confirmed by science to be real. Compare Real After All, an in-universe counterpart where a creature that is considered a myth or superstition is revealed to really exist in the universe of the work. Also compare Right for the Wrong Reasons, where someone coincidentally arrives to the right conclusion despite being mistaken about the facts, and Reality Is Unrealistic, where someone might believe something doesn't exist or is incorrect despite actually being real. A subtrope of Accidentally Correct Writing. Not a Subtrope of Defictionalization unless the real-life species or breed is a result of artificial selection or genetic engineering that is inspired by fiction. Contrast Science Marches On, where new discoveries prove assumptions or even previously admitted certainties wrong. One Sunday strip of Calvin and Hobbes featured the "Calvinosaurus", a monstrous carnosaur which is bigger than Tyrannosaurus rex and eats sauropods. 1995 saw the discovery of a sauropod-hunting carnosaur that gained fame for usurping T. rex in size, and its name is Giganotosaurus. Although it should be noted Giganotosaurus is roughly the same height and mass as T. rex, whereas Calvinosaurus is ridiculously enormous to the point of devouring the largest sauropods in a single bite. In the third Villain Song of Jo Jos Bizarre Adventure One Cartoonists Dream, the Disneyfied version of Pet Shop the falcon is traced from Iago. This was most likely done because Iago is the only villainous bird in the Disney Animated Canon, but falcons are actually more closely related to parrots than they are to hawks and eagles . A Bug's Life: Dim was a member of a fictional species of rhinoceros beetle created for the movie. Eight years after the movie's release, a real species of rhinoceros beetle that resembled Dim, called Megaceras briansaltini, was discovered. This trope was coined "the Dim Effect" by its discoverer Brett C. Ratcliffe because of this. Scrat from the Ice Age movies, a franchise starting in 2002, is a sabre-toothed squirrel. Cronopio dentiacutus is a small (8-9 inches long) squirrel-like mammal with a long snout and sharp canines, discovered in 2011. However, it lived during the Cretaceous Period, not the ice age, wasn't a rodent, and probably didn't eat acorns. In The Good Dinosaur, the protagonists are attacked by a snake sporting four small, lizard-like legs. When the movie was developed, although there was a lot of indirect evidence that snakes evolved from four-legged ancestors, no such snake was known in the fossil record. Only a few days after the release of the movie's trailer in 2015, Tetrapodophis was discovered. Monstro the whale from Pinocchio resembles a gigantic sperm whale with huge teeth on both upper and lower jaws, something real life sperm whales lack (having only thin teeth on their lower jaw). In 2008, a prehistoric sperm whale called Livyatan was discovered with gigantic tearing teeth on both jaws. The velociraptors of Jurassic Park are nothing like and much larger than real-life Velociraptor, and are based on Deinonychus instead. However, after filming had started a movie!raptor-sized dinosaur, called Utahraptor was discovered. In the years since then, another dromaeosaur has been found matching Jurassic Park's raptors for size, and it lived in roughly the same time and place as the raptor Grant was digging up. It's called Dakotaraptor . Both are still not complete matches, since Utahraptor and Dakotaraptor had feathers (the arm bones of Dakotaraptor even have quill knobs to prove it) unlike the raptors in the book and movie. Also, Utahraptor turned out to be more bizarre-looking than JP's raptors. The size of Spinosaurus, known by mostly fragmentary remains at the time, was exaggerated in order to make it a more temible threat than the previous films's Tyrannosaurus. Later findings revealed that Spinosaurus was the largest carnivorous dinosaur of all time. The scene with the Spinosaurus swimming behind a river boat and sneaking on it was recycled from the first book, where a Tyrannosaurus did this on a park's tour barge. It was already known at the time that Spinosaurus was mainly a fish eater but it was believed it stayed on the river margins and captured passing fish like a crane or a grizzly bear. In 2014, it was revealed that Spinosaurus was adapted to swimming to the point of being semiaquatic, and having trouble walking on land on two legs. In King Kong (2005), Skull Island apparently has a breed of theropod dinosaurs that developed batlike wings in lieu of feathers. Ten years after the film's release, a real theropod with a similar adaptation (Yi qi) was confirmed to exist, though it still has feathers. In Napoleon Dynamite, the main character doodles "ligers", "a lion-tiger mix, bred for its skills in magic." Since the creature looks nothing like a real one, it is obvious that the filmmakers were unaware that lions and tigers can breed in captivity and that the hybrids they produce are indeed known as "ligers". People who watched the movie first may believe that reports of ligers are hoaxes because of it. Hobbits are small human-like beings in Tolkien's Legendarium, first appearing in The Hobbit in 1937. When the prehistoric hominid Homo floresiensis was discovered in 2003, it got the nickname "hobbit" due to its similar size to the race in Tolkien's books. Some species described in the Speculative Documentary book The New Dinosaurs: An Alternative Evolution were later described in some form in real life, although most didn't resemble Dixon's creations except in the most basic concepts. Dwarf island dinosaurs were discovered in the form of Hateg Island dinosaurs and Europasaurus. Long-necked, long-legged running pterosaurs became reality once better remains of Azhdarchids were discovered (Dixon's were flightless however). Small arboreal coelurosaurs, such as microraptorines and scansoriopterygids. Large flightless birds evolving in the presence of non-avian dinosaurs; Gargantuavis in particular is not too unlike the troumble. Fur-like plumage on ornithischians (Tianyulong, Psittacosaurus, and Kulindadromeus). A number of dinosaurs are portrayed with "fur", which, at the time, was a very unorthodox idea. As science marched on, it was discovered that many dinosaur species were covered in downy feathers that could look fairly fur-like. An Asian coelurosaur that glided with membranous wings: Yi. A pterosaur using its wings in a penguin-like manner: Alcione elainus. Bakker included a therizinosaur ("segnosaur") in Raptor Red's story even though none were known from the right time and place when the book was written. (Perhaps not coincidentally, it was depicted as a mountain dweller, therefore living in an environment unlikely to preserve its fossils.) A decade later, a therizinosaur (Falcarius) contemporaneous with Utahraptor was published. In the Tarzan book series, starting in 1912, the protagonist is raised by a fictional ape species named "Mangani", which combines the physical and behavioral traits of chimpanzees, gorillas and primitive humans. In 1996, in the Bili Forest in the Democratic Republic of Congo, a subspecies of chimpanzee was discovered that is larger than other chimpanzees and shows some gorilla-like behavior. The similarity between the Mangani and the "Bili ape" did not go unnoticed. A filter-feeding anomalocarid, "Cetiocaris", was almost immediately followed by the discovery of Tamisocaris. The discoverers referenced the fictional creature directly when they proposed the name Cetiocaridae for a new clade containing Tamisocaris. The small, tree-climbing, long-fingered scansoriopterygid dinosaurs, which were interpreted at the time as aye-aye like, were speculated to be gliders with membranous wings similar to gliding mammals, but unheard of in dinosaurs. Yi qi, a new scansoripterigid with preserved membrane impressions, was published three years later. The pterosaur Rhamphorhynchus depicted as diving into the water to catch its prey, rather than skim-feeding on the surface. This is now considered the likelier feeding method of most pterosaurs. In the second book of the Earth's Children series (1982), set in Eastern Europe 30,000 years ago, Ayla claims to have seen a sabertooth cat once. This is treated as a case of Not So Extinct, as an amazed Jondalar replies that he only knows of a very old man who had seen one, but it was still a stretch at the time: sabertooths were believed to have disappeared from the Old World in the Middle Pleistocene, thousands of years before modern humans colonized Europe. However, a Homotherium jaw was fished out of the North Sea in 2003, and dated right to the time setting of the book. The dromaeosaurid from the last episode of Walking with Dinosaurs, "Death of a Dynasty", was seen as an example of Anachronism Stew, as Dromaeosaurus (what the animal was called during production despite its flaws) was extinct by the K/Pg extinction. Skip ahead to 2015, and a dromaeosaur just the right size to match with this creature was discovered in the exact formation the episode takes place in (Dakotaraptor). When The Future Is Wild came out in 2003, fans assumed that the four-winged Great Blue Windrunner was inspired by Microraptor, a gliding dinosaur discovered to have been four-winged in the same year. However, according to Dougal Dixon, the Windrunner was thought up alone by the show's ornithology consultant Phil Currie, without Currie being aware of Microraptor. The 5 million year AD segment has "Carakillers", a flightless terror bird-mimic evolved from South American caracara. In 2008, a flightless caracara from Pleistocene Jamaica was described. Saurian's decision to paint the Dakotaraptor eggs blue was inspired by eggshells of Oviraptor, a distant relative of dromaeosaurs (the devs only decided to also feature a playable oviraptorosaur, Anzu, later). It was later discovered that the eggs of Deinonychus, a very close relative of Dakotaraptor, were also blue. Hero Oh Hero features an In-Universe version; there's a race of people with strong nature-themed magic, pointed ears and green coloration who are called "elves" as a slur by The Empire, because of their resemblance to the elves in their folklore. In 500 BC, Hanno the Navigator described a tribe of "hairy women" he encountered in Gabon, that the locals called "Gorillas". His report was largely disregarded as a traveler's tale, but in 1847, a large, hairy hominid was indeed discovered in Africa, which was named "gorilla" after the creature described by Hanno. The animal, now called the western gorilla, has become prominently featured in popular culture from the 1860s on. note The eastern gorilla (also known as the mountain gorilla) was first described in 1903. Whether or not Hanno's "gorilla" is the same as the animal we know today is still unknown. For a long time, pterosaurs with both teeth and head crests only were known in popular culture, mostly in the form of toys (smaller species with toothy jaws lacked crests, whereas larger species with spectacular crests lacked teeth). In 2003, a pterosaur having both features was discovered, and was given the name Ludodactylus, from the Latin word "ludus" meaning "toy". In 1915, an ornithologist named Steve William Bebee hypothesised a "Tetrapteryx" stage in bird evolution where avian ancestors had feathers on their wings and legs. In 2003, Microraptor was discovered. They were the first dinosaurs found with feathers on both their wings and legs. Maned domestic cats, that is, maned like a male lion, are a good example of this. Back in the 1990s, the "Longhair Sphynx" or "Powderpuff Sphynx" was a cat fancy April Fool's joke, poking fun at breed classification by registries. Several years after the joke, a longhaired mutant Sphynx really did appear. Said cat was a neutered domestic pet. It had long, fine fur on the chest and sides and short fur on the legs, but was bald elsewhere. This gave it the appearance of a maned cat. In February 2009, a similar cat, known as Ugly Bat Boy, was reported in Exeter New Hampshire, USA. He was part of a litter of four kittens, two normal, plus he and a similar-looking female sibling that died at a few weeks old.